Barking out commands to control varying lights and devices around your home is a ridiculously seductive Star Trek-like concept, which explains the sudden interest in voice-control smart speakers. While there are multiple voice assistant platforms to choose from – Amazon Alexa, Google Assistant, Apple's Siri (HomePod), Samsung Bixby and Microsoft's Cortana – only Amazon and Google have allowed other speaker makers to incorporate their respective voice command technologies in an increasingly diverse array of Wi-Fi and/or Bluetooth models ranging in price from $30 to $350. Alexa is present in the largest number of smart speakers, more than a dozen right now, with at least another half dozen due in the next few months. The safe and obvious Alexa-compatible smart speaker choice is Amazon's own second-generation Echo ($100). It has decent sound, it will always have the latest Alexa features, and be compatible with any new services that roll out. Plus, multiple Echo devices (including the Dot, $50, and Echo Plus, $150) can be configured for multi-room whole-home audio. That said, the Echo isn't the best speaker for every use case, since it isn't waterproof or battery powered, which limits its flexibility, and it doesn’t have audiophile-quality sound. 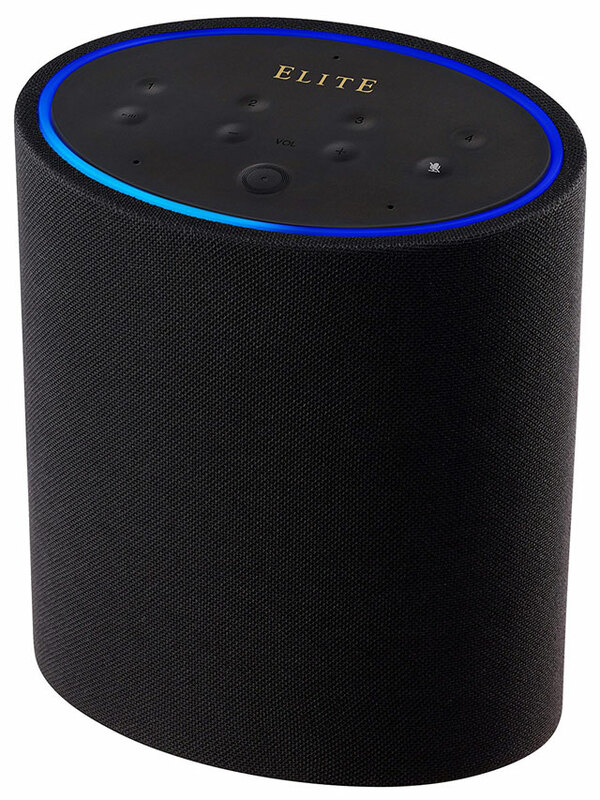 Each of the following Alexa-enabled speakers has its own specific feature set designed to address different needs that aren’t as well-met by the Echo. For instance, there’s a soundbar that’s perfect for use with your TV, a speaker that you can bring to the beach and a clock radio for your nightstand. Here are the best half dozen models, beyond the Amazon Echo, built to meet your particular smart speaker needs. You likely already have a music-playing device in your bedroom – your clock radio. But outside of waking you up or maybe putting you to sleep, a clock radio doesn't do much, and its radio/ music reproduction is usually awful. 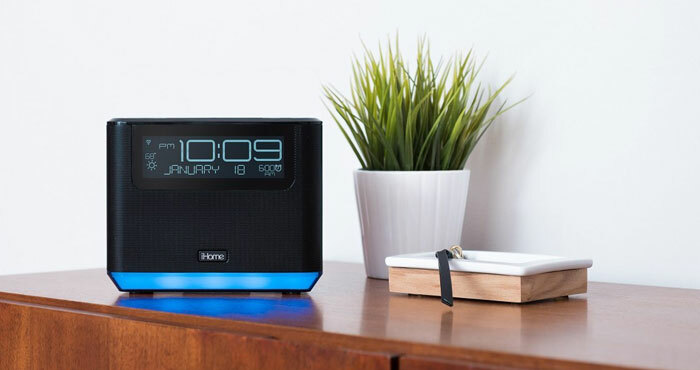 Instead of adding a smart speaker to your clock radio, we recommend a smart replacement, this iHome iAVS16 Alexa-enabled alarm clock. 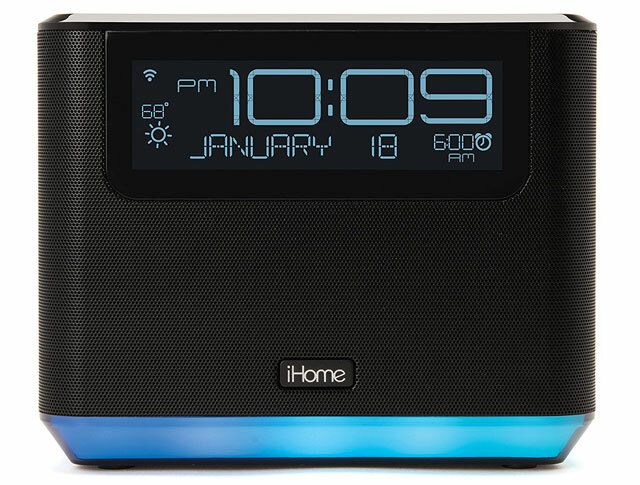 iHome makes some great-sounding clock radios, and the iAVS16 carries on that pleasantly surprising aural tradition. Technically, the iAVS16 technically isn't a radio – to listen to the "radio” you have to ask Alexa to play a particular station via the internet or ask Alexa to wake you to Spotify music or an iHeart Radio station. The clock radio has Bluetooth built-in so you can pair it with your smartphone for more music options. As a clock, the iAVS16 has a large dimmable display that shows the outside temperature, any alarms set, in addition to the time. And while you speak most operational controls as you would to any Alexa-enabled device, you also get a comforting and convenient physical snooze button. The iAVS16 also has a handy 2.1-amp USB port for charging your phone and, when paired with your phone, can serve as a speakerphone. Along with Alexa smart home voice control, there are three physical programmable smart home buttons. However, the buttons will only operate devices plugged into an iHome SmartPlug ($30 on iHomeAudio.com, $33 on Amazon). If you want audiophile-quality sound, your best choice is the Pioneer Elite VA-FW40 F4. The compact speaker contains dual 2.5-inch full-range woofers powered by discrete switching DSP amplifiers, which means the right frequencies get reproduced when they're supposed, and delivers deep yet agile but not over-powering bass thanks to its dual passive radiators. It’s also certified for DTS PlayFi, the company's multi-room technology. All multi-room speakers only work with speakers from single brands; Play-Fi allows you to group any PlayFi-certified devices around your home, regardless of brand, to play in concert. PlayFi devices range from individual speakers to receivers to home theater systems. DTS also validates that PlayFi speakers accurately render audio from supported compression modes and formats, such as most un- or only slightly compressed HiRes audio streams via Wi-Fi. This validation is important because Bluetooth double compresses standard digital music files, which degrades sound quality. This Pioneer's downside is the only music service you can access via Alexa voice-command is Amazon Music, which only is available with an Amazon Prime subscription. All other music services, including Pandora, TIDAL, Deezer, Napster, SiriusXM, and TuneIn, have to be streamed from your smartphone directly via WiFi. This isn't a deal-breaker, just a minor annoyance since this is a voice-command speaker. But you do get an auxiliary audio input to physically connect other source devices such as a turntable or media player, and an output to play Amazon Music on an existing stereo or home theater system. TV speakers are notoriously bad. So, a smart soundbar you can connect to your TV makes sense for the room where you watch the most TV and movies. 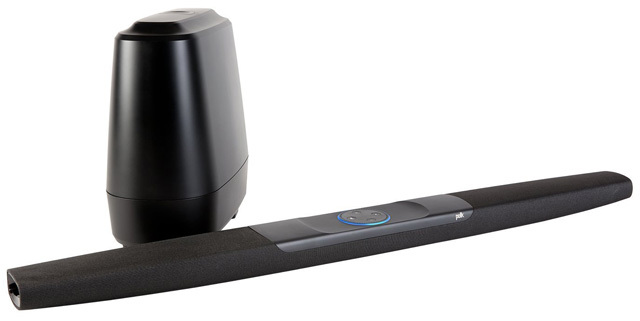 Polk’s 260-watt Command Bar delivers room-filling Dolby and DTS surround sound with its main speaker bar, which houses twin 1.25 x 3.25-inch full-range drivers and two 1-inch tweeters, and includes a separate wireless ported 6.5-inch subwoofer. A far-field microphone array helps the Command Bar hear your voiced-orders, but you may find yourself shouting to be heard above blockbuster movie cacophony. And, the Command Bar has an actual Amazon Dot built-in. So in addition to voice control, you have the same physical buttons for turning the mic on and off and controlling volume. For convenience, underneath the Command Bar, there is a recessed compartment with a 4K-compatible HDR-compatible HDMI jack to accommodate an Amazon Fire TV Stick, and there's also a USB jack. If you’re looking to play audio from your TV on the Command Bar (streaming services built into your TV, for instance), there’s an HDMI Audio Return Channel (ARC) output for connection to your TV, as well as an optical input for an alternative TV audio connection. The Command Bar is built to complement 42-inch and larger TVs and can be set on a tabletop or wall-mounted. HDMI and optical cables are included in the box. Sonos invented the whole idea of whole-home wireless audio. So, Sonos' inherent whole home audio expertise coupled with the Sonos One's premium audio quality make this speaker a no-brainer choice for those who want premium sound in every room and Alexa control over a wide range of music services. While the Sonos doesn't deliver the even crispness across all frequencies like the Pioneer F4, it delivers a bright, light sound best-suited for pop, rock, and jazz, and delivers even more impressive results with a wider soundstage when you pair two to create stereo. And the app includes room-tuning so you can enhance the sound based on the room’s specific acoustics. A far-field six-microphone array ensures Alexa will hear you, even when the music is playing loudly. The Sonos One is stunningly easy to set-up – the app steps you through both the Sonos-to-WiFi connection as well as the pairing to Alexa in less than five minutes. You can ask Alexa to play tunes from Spotify, Amazon Music, Apple Music, internet radio and 80 other streaming services, but any music stored on your smartphone or tablet will have to be manually streamed over WiFi to the Sonos One via the Sonos app. 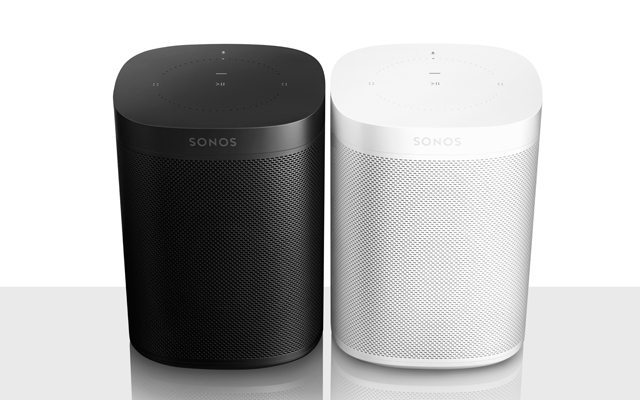 The Sonos One is available in either black or white to match your aesthetic needs. 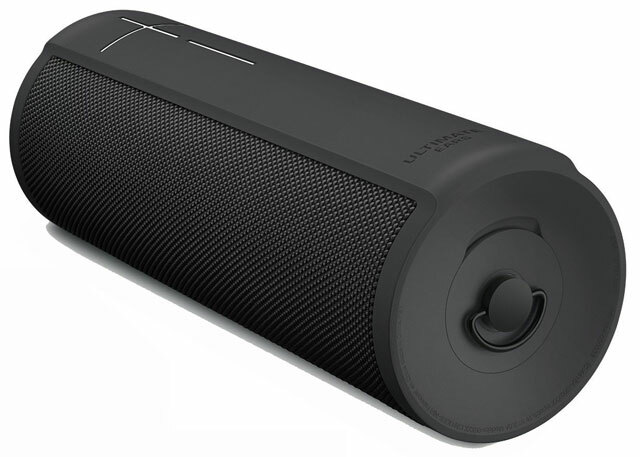 There is no greater beach or pool party companion than Ultimate Ears' Megablast. First, the Megablast loud – it can pump out 93dB of beat-laden bebop, enough to dominate most noisy indoor or outdoor locales. It's IP67 waterproof, which means it's both sand- and dustproof, and can be safely submerged up to around three feet for up to a half hour without harming it. And since it's waterproof, it also makes a fine cooking aid in the kitchen. Best of all for portable use, it can play up to 16 hours on a single battery charge, the longest battery life of any smart speaker we've come across. In terms of sound quality, you get surprisingly balanced results from high- to low-end, and Alexa will be able to hear you even if the volume is turned all the way up. The Megablast can't stream Spotify or Apple Music on voice command, though (just Amazon Music, Pandora, SiriusXM, iHeart Radio and TuneIn), and you'll want/need to buy the optional Power Up ($40 on Amazon or UltimateEars.com) charging pad for indoor home use. If the Megablast is if too pricey, the similarly IP67-protected Altec Lansing VersA ($129.99) is less than half the price, but won't deliver the loud level of outdoor entertainment you'll want. Even if it's not blasting, you'll still be able to locate the Megablast even if it's half-buried in a dune. It's available in bright pastel blue "steel" and a deep "merlot" red, along with black and white. Yes, you can locate any smart speaker – especially one that's waterproof – in your kitchen to aid your cooking or supply a soundtrack for your cleaning or casual meals. But countertop space can be precious, and it may be difficult to justify even the minimal footprint a smart speaker occupies. That's where Platinum Wireless Under Cabinet Speaker from iLive comes in. Since you mount it under a cabinet, it takes up no valuable counter space but still supplies all the Alexa-powered voice-activated measurement conversion, recipe detail, Amazon grocery list additions, cooking timers and smart appliance control you need without having to wash your hands off first. 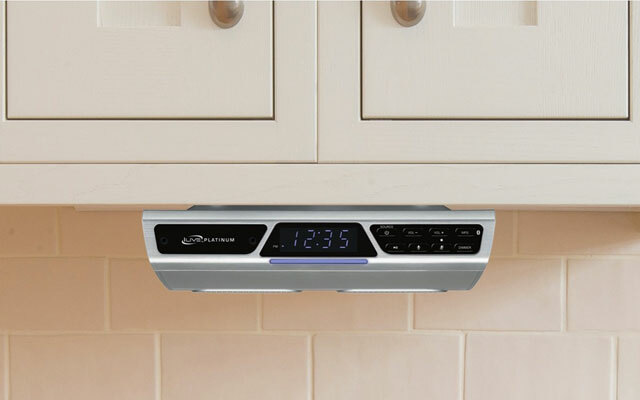 For convenience, there are physical buttons so can manually power it on/off, mute/unmute the speaker, raise/lower the volume, dim the large blue LED clock or directly pair the speaker to your home network. For musical accompaniment, you can use Alexa to access iHeartRadio, TuneIn and Amazon Music. Or, which paired with your phone, you can enjoy songs from streaming apps or tunes stored on your phone. And if you've got several other iLive speakers, you can create a multi-room system.